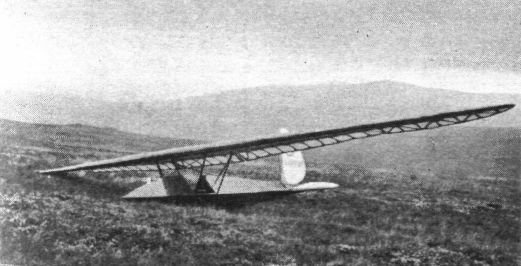 A FEW weeks ago we made brief mention to the "Scud" glider, manufactured by Brant Aircraft, Ltd., of Croydon, and this week we are able to give further details, together with general arrangement drawings, ДальшеMore>>> of this glider. 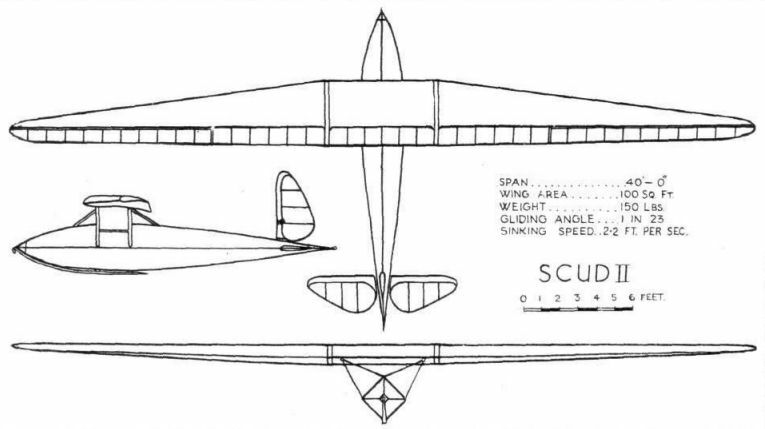 The "Scud" has been designed as a British attempt to meet the requirements of gliding clubs and private owners for a practical glider of greater efficiency than the primary or Zogling type, and capable of soaring, but without the high first cost and practical difficulties of operation of the superefficient sailplanes as produced in Germany for record purposes. It is a machine for the "B" or "C" licence pilot who is sufficiently skilled to appreciate and take advantage of really effective controls, and who wants to practice soaring flight as distinct from gliding down a hill on a machine with little or no control. It is at the same time a machine which embodies features of a practical nature, such as ease of operation, handling on the ground, and dismantling and ease of repair. This has been achieved by a design which results in a very much smaller machine than contemporary German machines, and of little more than half the weight. One of the advantageous results of this feature is that the machine has not the sluggishness of control usually characteristic of gliders, caused by their relatively large moment of inertia and low air speed. From a practical point of view a small light craft has also many advantages; it is possible, for instance, for four persons to carry the machine with ease, and to facilitate this four hand holes are provided, the weight to be carried by each person being only about 26 lb. A further advantage of a light machine is the smaller launching party required. 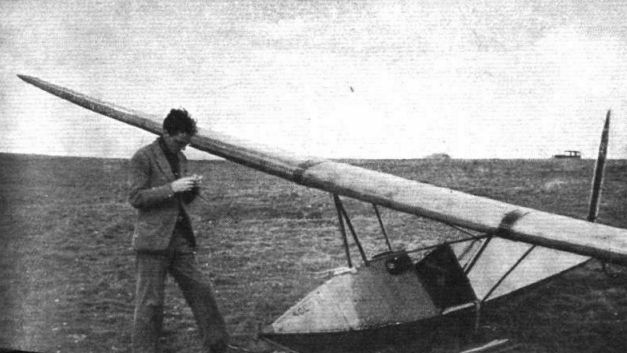 Furthermore, the small size of the machine, obviously, has many advantages from the all-important dismantling and stowing point of view, and a good deal of care has been taken and many features embodied in the design which should greatly facilitate this usually very tedious part of glider operation. The attachment of wing to fuselage, for instance, is such that the complete wing may be detached by the withdrawal of four bolts locked by wing nuts, the struts remaining in position on the fuselage and the wing stowed as either one unit, of the wing may be separated into two halves by disconnecting the centre joint, as when it is necessary to pack the machine in a trailer. In the latter case the struts may also be folded down against the fuselage; moreover, when taking the wing off it is only necessary to withdraw two pins in order to disconnect the aileron controls from the fuselage, and on separating the wing into two halves it is not necessary to make any further disconnection in the aileron control, as the ailerons are operated by independent shafts in the wing connected to push-and-pull rods from the fuselage. Provision is made on the push rods for adjusting aileron trim, if necessary. There are no wires in either the wing truss or aileron controls. The complete tail unit may be dismantled with even greater facility and without disconnecting any of the controls. There are no fixed surfaces, and the two elevators and rudder may be withdrawn from the short stub tubes which project from the fuselage by pulling out two draw-pins provided on each unit, and which are normally held in position by leather straps - the controls remaining attached inside the fuselage to the stub tubes. The complete tail unit may therefore be dismantled without the use of tools in about three minutes. The elevator and rudder control cables run inside the fuselage direct to the controls without pulleys being necessary, and provision is made for ease of access in the event of adjustment being necessary. The fuselage is an extremely simple and robust design, which in the event of damage should be very easy for the amateur to repair. It consists of a flat-sided rectangular box construction, having four ash longerons and ply covering, and is arranged in a diagonal diamond-like position such that one corner of the square section forms the keel, to which is attached the skid chassis. The top longeron is necessarily cut away in way of cockpit, but the wing-truss struts are so arranged that virtually they form a continuation of the top longeron over the cockpit - the top longeron, as a stressed member, thereby becoming redundant between the wing-drag strut attachments fore and aft. Owing to the light structure weight of the machine, it is not necessary for the pilot to be much in front of the centre of gravity, and it has therefore been possible to arrange the pilot's seat upon the two fuselage bulkheads which form the points of attachment of the wing-lift struts and the skid shock-absorbers. This concentration of the main loads on to the two central bulkheads of the fuselage, results in a particularly stiff and light structure capable of dealing with severe landing loads. The design of the fuselage also lends itself to dealing with launching loads - both the hook and the release attachment on the tail - without putting strains other than direct tension on the longerons. The wing is a simple cantilever construction covered with ply forward of the rear spar, the ply skin dealing with drag and torsional loads and forming with the two spars a box construction, particularly stiff in torsion. The trailing edges are of cord, as a reminder to those handling the wing on the ground that this part of a wing, even when provided with a stiff trailing edge is quite unsuited for either handling or supporting the wing. The landing skid is attached to the fuselage at the three points: in front, at the launching hook, in such a way that any side movement can take place without straining the attachment or the fuselage; the two shock absorbers under the main bulkheads form the other two points of attachment. The shock-absorbers consist each of two sausage-shaped rubber blocks resting in a cup-like fitting on the skid, with the fuselage seating, at the apex of its V-shaped bottom, between the two blocks - giving a self-centring arrangement which, with a side load due to drift while landing, does not put a twisting strain on the shock-absorber assembly or its attachment to the fuselage. The only positive attachments of the skid at these points to the fuselage are leather sidepieces whose main function is to prevent the skid from falling away from the fuselage when the machine is off the ground. These leather attachments are each secured to the fuselage by one through bolt only, which on withdrawal permits the skid and shock absorbers being dropped clear for repair or the renewal of the rubber blocks, which may then be dropped into place on the skid fittings. Length o.a. 13 ft. 4 in. Height 4 ft. 0 1/2 in. Main 'plane (including ailerons) 85 sq. ft.
Wing loading 3-1 lb./sq. ft.
Gliding (L/D maximum): Optimum gliding angle, 15-1; machine speed, 35 m.p.h. = best gliding speed for maximum duration (calm air). Soaring (L2/D2 maximum): Minimum rate of descent, 3-23 ft./sec. ; machine air speed, 31 m.p.h. = best soaring speed for maximum climb and duration (minimum up-current required, 3-23 ft./sec). IT has become clear that a gliding club contains too many pilots to operate sailplanes of the high efficiency type economically, because the expenses are mostly due to crashes which can only be avoided by the most rigid selection of pilots. Thus, there is now a tendency for pilots, when they have gained sufficient experience on club machines - and there is a healthy increase in their numbers in the country - to form themselves into private-owner groups or private owners, and acquire machines of the high efficiency class. The "Scud II" has therefore been designed by Mr. L. E. Baynes as a high-efficiency sailplane for private owners, and is a development of the well-known "Scud” intermediate machine. 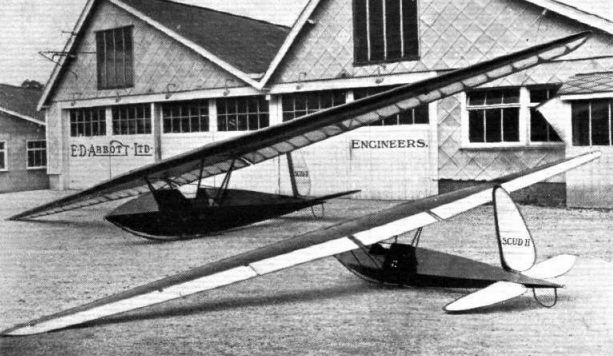 The first "Scud II," the construction of which has just been completed by E. D. Abbott, Ltd., of Farnham, has been built to the order of Mr. N. Buxton, of the London Gliding Club. The new design was for a machine of 40-ft. span and 100 sq. ft. wing area, and the weight empty 150 lb. These dimensions were of great interest when it was heard that the Darmstadt Academic Group was going to build a machine intended to be of high efficiency of very similar dimensions. There is thus a notable tendency towards smaller machines, as the improved manoeuvrability that results is to-day considered essential for thermal soaring flights. The original "Scud" first showed the way, being less than half the weight and size of contemporary machines in its class, and apparently no less efficient. The "Scud II" is, as might be expected, again half the weight of the conventional sailplane. This is obviously not at the expense of strength, as the general construction is very robust and the design has been passed as up to the necessary load factors by the B.G.A., who now require a factor of 6 for the C.P. forward case. 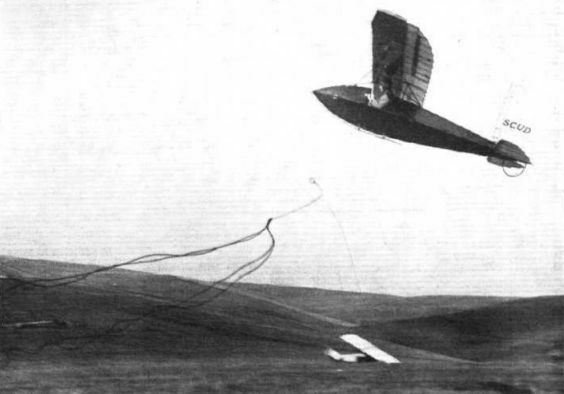 The estimated gliding angle is 23:1, the sinking speed 2.2 ft./sec, and the Schwingungzahl (wing beats) 250 per min. If these figures are attained, it should prove an excellent private-owner's sailplane, as, apart from the manoeuvrability, small size and light weight are a great advantage from the storage and transport point of view. The little "Scud" was original in its layout, and many novel features were incorporated in its design; these have mostly been retained in the new machine, such as the simple and light type fuselage, which is a square section turned on edge in the form of a diamond. The length has been increased, but the cross-sectional area remains the same. 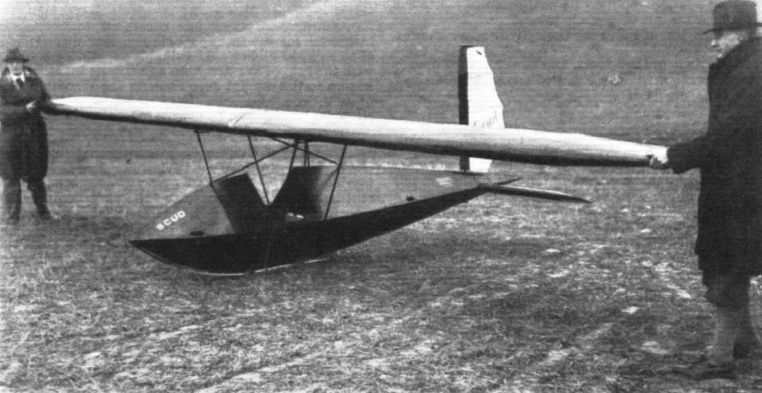 The wing is, as before, carried above the fuselage by a system of struts, which also serve to carry the loads over the space for the pilot's cockpit, and thus save considerable fuselage weight. The neat tail unit, with the interchangeable swivel-type rudder and elevators, has also been retained. The biggest departure has been made in the wing design, which is now a single-spar, tapered and twisted wing with a pronounced sweep back of the leading edge, and is of much larger span and aspect ratio, namely, 16:1. The aileron controls have been redesigned, and now incorporate an automatic release at the wing joints, and a chain and sprocket type differential gear. 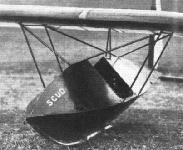 A feature of the original “Scud'' was the very much higher wing loading than is conventional practice; this has been slightly increased on the new machine, and is now as high as 3.5 lb./sq. ft. The span loading is, however, owing to the light all-up weight, comparatively low. The price of the "Scud II" will be ?150. A three-quarter front view of Brant Aircraft Co's. "Scud." Mr. Mole about to take off in the Scud at Rottingdean. The small size of this glider is very evident here. WELL UP: The little Scud caused a lot of enthusiasm for British built gliders at the recent International Glider Meeting at Balsdean. 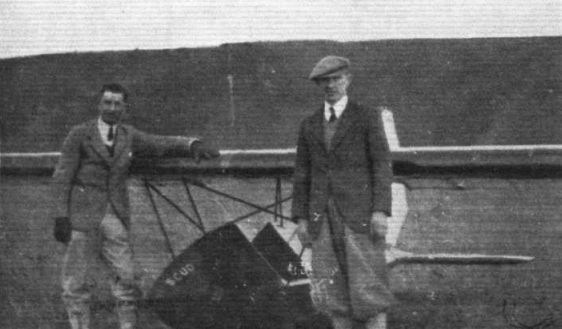 F. O. Mole made several excellent flights on it and E. D. Abott, Ltd., of Farnham, the builders, together with Mr. L. E. Baynes, the designer, will we trust reap the benefit of their enterprise. 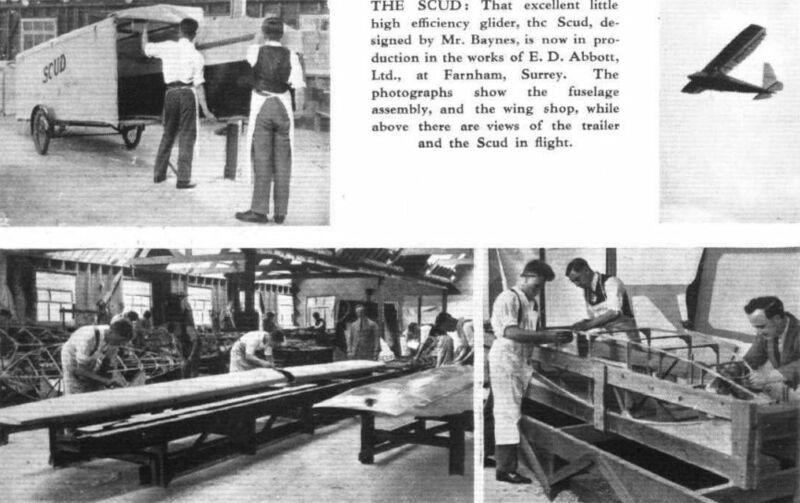 THE SCUD: That excellent little high efficiency glider, the Scud, designed by Mr. Baynes, is now in production in the works of E. D. Abbott, Ltd., at Farnham, Surrey. 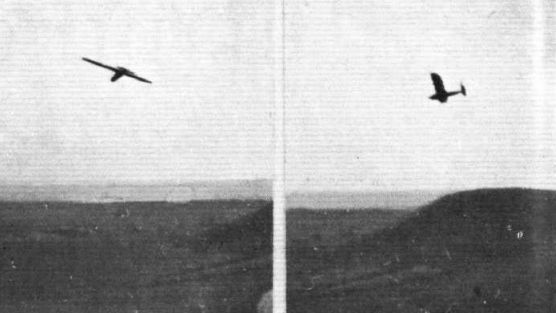 The photographs show the fuselage assembly, and the wing shop, while above there are views of the trailer and the Scud in flight. A BRITISH SAILPLANE: The "Scud II" flying at the London Gliding Club's ground, Dunstable. Three-quarter front and rear views of the Scud II outside Mr. E. D. Abbott's works at Farnham. A front view of the Scud II showing the clean lines.